To err is to Heretic. To arr is to Pirate. Heresy Hurricane Season is wreaking havoc. A team of Berean Pirates are fighting the good fight against the perfect storm of heresies infecting churches. Will truth prevail and the churches reform? Or will the heretics survive to lead many astray? 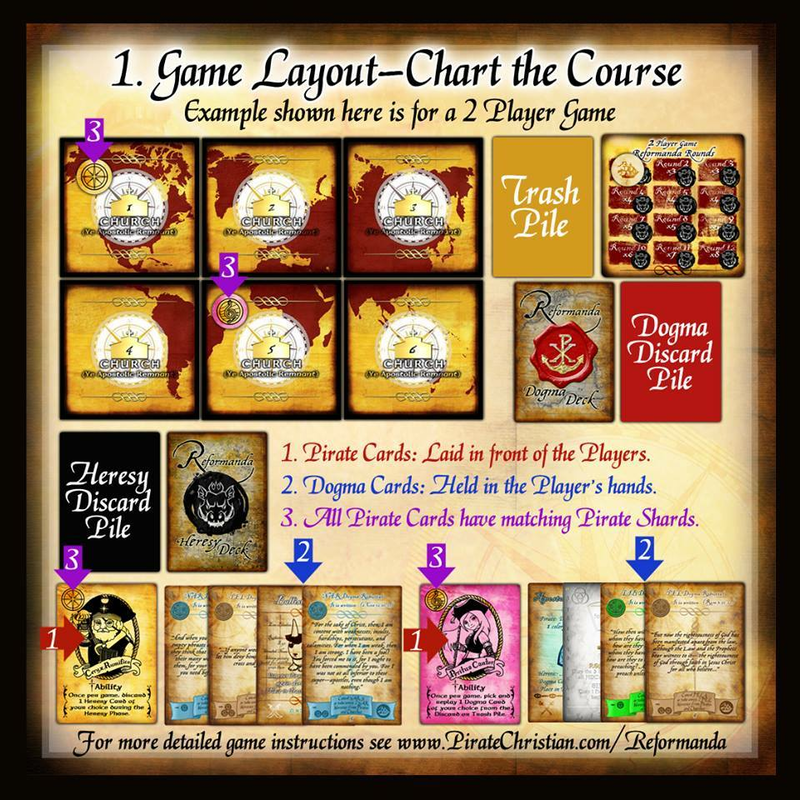 Reformanda is a collaborative, educational and fun card game for 2-6 players (aka Pirates). 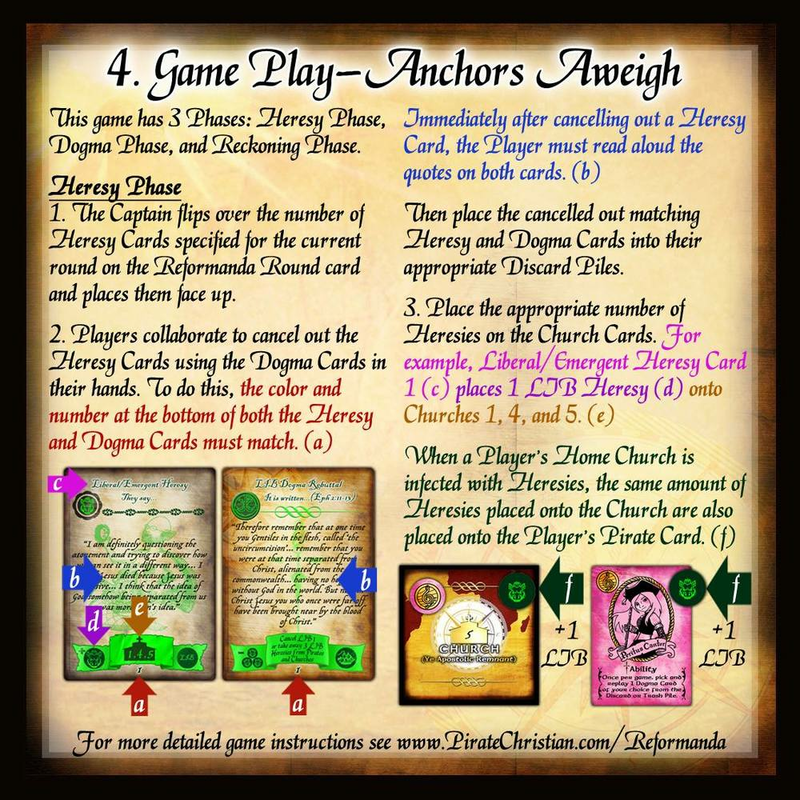 Pirates will hone their discernment skills and strategically collaborate, countering heresy with Scripture, using their abilities, weapons, loot and spiritual gifts to rescue those who have been infected with heresies. Let no man deceive you. How do you play Reformanda? Instructions on how to set up and play Reformanda are featured on the Reformanda Rounds Cards Image Gallery below. For complete and detailed rules, please click and download the Rule Book PDF. Beloved in the Lord, The way to win Reformanda is NOT by bringing the Kingdom of God here to earth, nor is it about conquering the world for Jesus or even finding your purpose. Rather, winning this game is accomplished by working together with your fellow Players to keep your eyes on Jesus as your Lord and Savior, trusting in His Word even when the rest of the world is teeming with Heresy. As a Christian, you are called to proclaim the Gospel message in love with your neighbor, even when the Gospel is “out of season.” Pray for those who persecute you and take comfort in looking forward to the promise of the New Heavens and New Earth where you will forever dwell with our Lord and Savior Jesus Christ. Our hope is not in this world, but in Christ crucified for our sins. Click on the visual instructions below to zoom in and get a crash course on how to play and collaborate in the Reformanda Card Game. “Reformanda,” copyright © 2016 by Pirate Christian Media. All rights reserved. Scripture quotations are from the ESV Bible. The Holy Bible, English Standard Version® (ESV®) Copyright © 2001 by Crossway, a publishing ministry of Good News Publishers. All rights reserved. Read for free digitally via mobile apps or online through ESVBible.org.